50 | Kitchen & Bath Design News | August 2015 Company Circle No. Page No. 21st Century Kitchen and Bath 14 29 Bertazzoni 1 2 Brizo 10 19 Chief Architect 4 9 Choice Cabinet 50 Custom Inserts 101 49 Delta Faucet Company 2 4 Doug Mockett 8 15 Dura Supreme 50 EuroAmerica Distributors 50 Fabuwood Cabinetry Corp. 18 35 Grabill Cabinet Co. Inc. 50 JSI Quality Cabinetry 12 25 Karran USA 19 37 Kitchen Trader 50 Kohler Plumbing 5 11 Mansfeld Plumbing 17 31 Company Circle No. Page No. McCarren Supply 50 Nantucket Sinks 21 48 Osborne Wood Products 15 29 Outwater Plastics Industries, Inc. 104 49 RealView 7 14 RICKI 22 51 SEN Design Group 16 30 Showplace Wood Products 9 17 Stanisci Design 103 49 Sub-Zero Inc. 100 49 Sunny Wood 20 48 Top Knobs 6 13 Toto USA 13 27 UltraCraft Cabinetry 23 52 White River Hardwoods 11 21 Whitehaus Collection 102 49 Wilsonart International 3 7 AGENCY REP: CABINETRY Chicagoland/Illinois Must be fuent in 2020 & design Send Resumes to: proflewd@charter.net Classifed Advertising Advertiser Index EuroAmerica Distributors • Distributor of Italian & German brands of Kitchen Cabinets, Bath Vanities, Wall Units, Closet Organizers and Italian Lighting. • Looking for experienced, aggressive sales people for East/West/ South/Southwest territories. • State of the art showroom and training center which includes 12 full kitchen displays and nine full bath vanity displays. • Candidates must have a solid background in selling to dealers, builders and contractors. Excellent salesmanship, verbal and written skills preferred. • Email resume and cover letter to: sales@EuroAmericaDistributors.com 248.649.8766 | EuroAmericaDistributors.com INDEPENDENT SALES REP OPPORTUNITIES Wanted to Buy: Surplus Building Materials Clean of your Dock and get paid for it. We buy discontinued products, wrong orders, dead inventory. No job too big. Call 717-249-2329 REGIONAL SALES MANAGERS Dura Supreme Cabinetry is now interviewing for a Western Regional Sales Manager and an Eastern Regional Sales Manager. Please submit resume and cover letter to marketing@durasupreme.com Full-service custom cabinetry manufacturer with national presence seeking established/ qualifed reps for multiple regions in the U.S. If you are qualifed and interested in being considered, please contact Kelli Roach at 260-207-5500 or email at kellir@grabillcabinets.com Kitchen & Bath Design News (USPS: 828-410, ISSN 8750-345X) is published monthly by SOLA GROUP, INC., 724 12th Street, Suite 1W, Wilmette, IL 60091; (847) 920-9513. Copyright© 2015 by Kitchen & Bath Design News . No part of this publication may be reproduced without written permission from the publisher. The publisher assumes no responsibility for the opinions expressed by editorial contributions to Kitchen & Bath Design News . The publisher reserves the right to reject any advertising not in keeping with the publisher's standard. Subscriptions free upon completion of qualification card to individuals and firms engaged in retailing, designing, wholesaling or manufacturing of kitchen cabinets, counter tops, bath vanities and built-in kitchen and bathroom products. One year subscription to non-qualified individuals: $55.00 payable in USA funds; print or digital copy within USA; digital copy only outside USA; valid email address required for digital copy. Single issues available to USA only (prepayment required), $10.00 each. 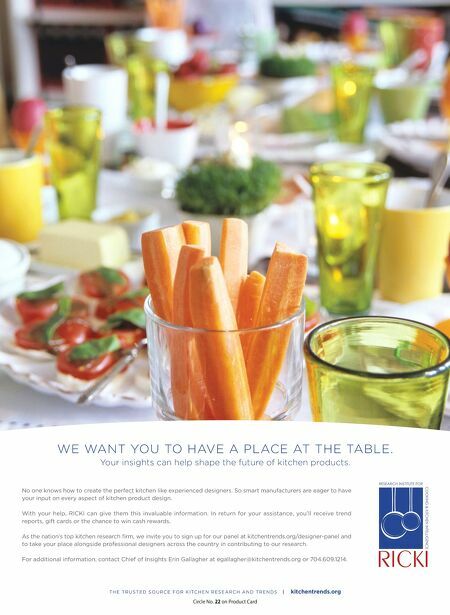 For subscription information and address changes, write to: Kitchen & Bath Design News , Circulation Dept., P.O. Box 3007, Northbrook, IL 60065-3007, or call (866) 932-5904, or email circ.kbdn@omeda.com. 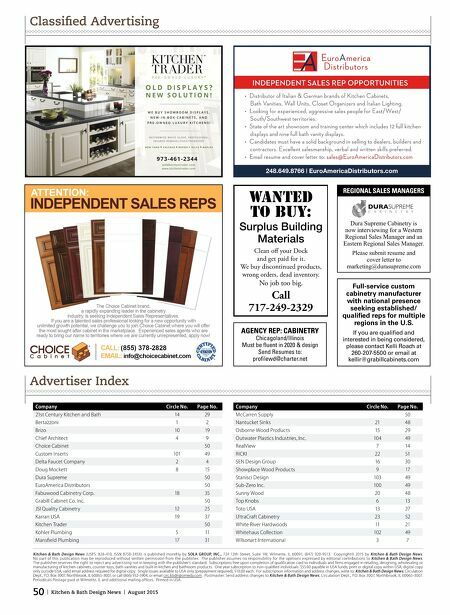 Postmaster: Send address changes to Kitchen & Bath Design News , Circulation Dept., P.O. Box 3007, Northbrook, IL 60065-3007. Periodicals Postage paid at Wilmette, IL and additional mailing offices. Printed in USA.